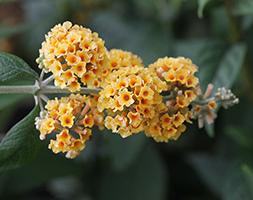 This easy to grow shrub will reward you with a spectacular show throughout the summer, when its clusters of golden yellow flowers appear at the ends of the long, arching branches. The flowers have a deliciously sweet scent, so try to plant it near an entranceway or seating area where you can take full advantage. It is tolerant of most conditions, but will be happiest in a sunny spot with soil that drains freely.